Your home naturally has a fire extinguisher and fire alarms in place in each room. You likely check these alarms regularly and replace the batteries when needed. However, these things are not enough for your child to know what to do in the event of a fire! 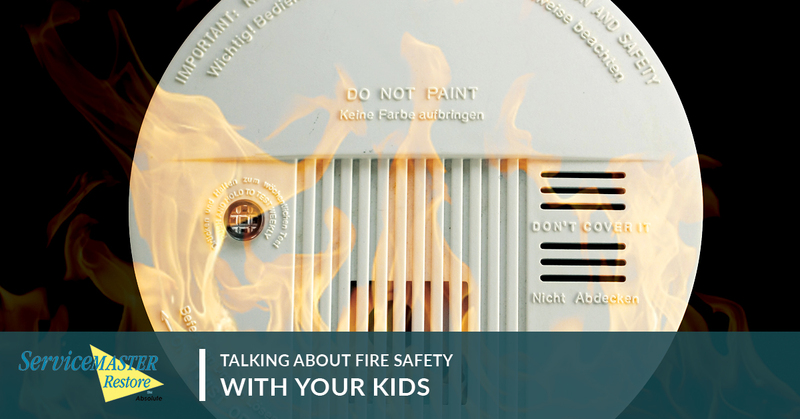 It’s important to keep your children educated when it comes to fire safety and prevention. Here are some of the top ways you can guide your child to better understanding the dangers of fire and household hazards. As you probably know, most fire hazards are located in the kitchen. However, your kids probably don’t know that. Teach them extensive kitchen safety, and do not allow them to use the stove or the oven until they are old enough to understand the hazards outside of just burns. The most important lesson for little ones to learn is that the stove is hot, and they should stay away from it when it is in use. Once kids are older, you can teach them appropriate appliance safety, as well as instruct them on how to put out any cooking fires. Aerosol cans: These cans may explode if there are places near a hot enough heat source, including stoves, radiators, etc. Warn them not to play with these cans and to store them in a cool location. Candles: Candles seem safe, but they can start a fire if they get too close to flammable materials, such as fabric. Even if the candle is far away from anything it can ignite, the wax is often hot and can burn skin! Don’t let your children light candles on their own, and teach them to blow out the candle whenever they leave the room. Electrical cords: If they spy a frayed electrical cord, have them tell you. You should show them how to identify these cords, as they are a fire hazard. Lamps: While lamps are safe on their own, children need to understand that paper or cloth over a lamp can eventually lead to a fire. This will keep them from putting flammable materials over the lamps in your home. Irons: Teach kids to stay away from irons that are on and sitting upright, as they could burn themselves. Christmas trees: If your family likes to use real Christmas trees during the holidays, teach your kids that live trees dry out over time. This dryness makes them more flammable. Talking about potential hazards will help your child think twice about any actions they take that could lead to a fire. Make sure to address these hazards as soon as your child is old enough to understand them! This old rhyme is still just as relevant now as it was when you learned it as a child. Teach your kids this important safety move in order to prevent serious burns should their clothes catch on fire. Have them show you that they understand the steps by demonstrating them, and always remind them to cover their face and mouth area in the event of a fire. If you want your kids to get excited about fire safety, it’s important to make practicing fun. Run a practice fire drill with your kids every few months. Start with a smoke alarm so your kids know how to recognize the beep as a warning that there is a fire. Create an evacuation plan for them to follow, and designate a chosen meeting spot outside of the house. Teach any child old enough to use the phone about 9-1-1, but make sure they only dial when it is an emergency and after they have gotten themselves to safety. Some children may find it funny to call 9-1-1 as a joke, so make sure they know that this is illegal and that the consequences will be grave if they do so. After your family has gotten to safety, and the fire has been extinguished, you will still have damages to deal with after the fact, unfortunately. In the event that your Corona home is in need of fire damage restoration services, please give our team a call. We would be happy to help you and your family as you work to repair what was lost. We offer smoke damage repair and odor removal services as well. Contact SM Absolute to learn how we can help you and your home!